_Burley became a mill village when cotton mills were built in 1790 and 1811 alongside the river. They used power derived from building a weir across the Wharfe. In 1833, 360 operatives worked in the mills, including some who had come as pauper apprentices from London. 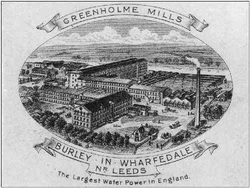 In 1850, Fison and Forster, partners who had started in business in Bradford, bought the Burley mills, and converted them to worsted production. The earliest mill was demolished and all new work was concentrated on the Greenholme site. Numbers employed grew to over 700. _From the mills, the workers would walk up Iron Row to reach their homes. Here is a picture of Iron Row looking towards the mill gates, taken by a local photographer, John Breare, on a special occasion, Queen Victoria’s Golden Jubilee in 1887. 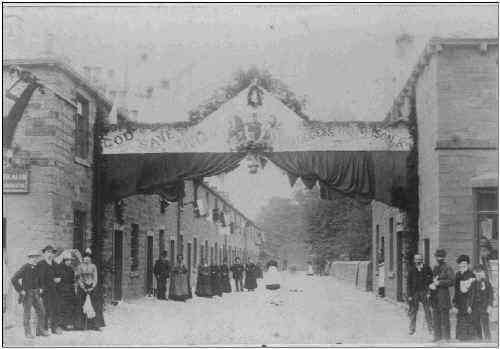 The decorated arch says, “God Save the Queen and Success to W. Fison and Co.” (the mill company).